NEW YORK (Reuters) - A federal judge on Wednesday rejected The New York Times' bid to force the U.S. government to disclose more information about its targeted killing of people it believes have ties to terrorism, including American citizens. U.S. District Judge Colleen McMahon in Manhattan said the Obama administration did not violate the law by refusing the Times' request for the legal justifications for targeted killings, a strategy the Times said was first contemplated by the Bush administration soon after the attacks of September 11, 2001. McMahon appeared reluctant to rule as she did, noting in her decision that disclosure could help the public understand the "vast and seemingly ever-growing exercise in which we have been engaged for well over a decade, at great cost in lives, treasure, and (at least in the minds of some) personal liberty." Nonetheless, she said the government was not obligated to turn over materials the Times had sought under the federal Freedom of Information Act (FOIA), even though it had such materials in its possession. "The Alice-in-Wonderland nature of this pronouncement is not lost on me," McMahon said in her 68-page decision. The newspaper and two reporters, Charlie Savage and Scott Shane, had sued the government for details about the government's drone program, including the late 2011 killings of U.S. citizens Anwar al-Awlaki and his 16-year-old son Abdulrahman in separate strikes in Yemen. Civil liberties groups have attacked the drone program, which deploys pilotless aircraft, as in effect a green light for the government to kill Americans without constitutionally required due process. U.S. Attorney General Eric Holder has rejected that contention. Among the materials sought by the Times was a memorandum that the newspaper had in early October 2011 reported had been prepared by the U.S. Department of Justice's Office of Legal Counsel. The Times cited people who had read the document. The Times said this memorandum had authorized the "legal targeting" of Anwar al-Awlaki, a U.S.-born Muslim cleric who joined al Qaeda's Yemen affiliate and directed many attacks. The Times said it plans to appeal McMahon's decision. "We began this litigation because we believed our readers deserved to know more about the U.S. government's legal position on the use of targeted killings against persons having ties to terrorism, including U.S. citizens," New York Times assistant general counsel David McCraw said in a statement. If bonds are a bubble, why haven't they already burst? When I first became a financial journalist, one of the principles hard-wired into the system for analysing securities was something called “the reverse yield gap”. This held that the yield on equities would always be lower than that on government bonds because, unlike bonds, equities offered a hedge against inflation. It was a principle that held good for well on 50 years, and was a surprisingly difficult mentality, once engrained, to shake off. Many, therefore, missed out on the long bull market in government bonds. The cult of equity continued to hold sway for much longer than it deserved. But it was not always so, hence the term “reverse” yield gap. Before 1959, the norm was for equities to yield more than bonds, both in the UK and the US. Since the crisis began, we’ve reversed spectacularly back to the pre-1959 norm. The yield on gilts is now substantially lower than that on shares. And indeed, in some respects, it is this norm which is the more logical. It is entirely rational at a time when investors fear deflation that the relative security of bonds should become overpriced, and that equity yields should be relatively higher to reflect the threat of a sustained collapse in dividends. The big investment question for this year is whether the yield gap might again begin to close, or even reverse back to its pre-crisis state. In any case, one of the most fashionable calls among investment analysts right now is that at some stage in the next 12 months, we’ll see the start of a great rotation out of bonds and back into equities. Certainly, it is quite hard to believe bond yields could sink any lower. But here’s a question. If everyone thinks government bonds are a bubble riding for a fall, how come it’s not already happened? Growth and inflation are two sides of the same coin, so if you think there is some chance of a cyclical recovery over the next year, you’d certainly be selling bonds. Equities are already to some extent reflecting such an outcome, with some substantial gains over the past year. So to bet on a significant rotation is also to bet on the return of growth. Well, everyone hopes for the best, but beyond the bounce in equity markets, which may be more driven by hunt for yield than faith in rip-roaring earnings growth, evidence for it is pretty thin on the ground. I’m perfectly prepared to believe that bond yields could rise a bit from present, historic lows, where they offer the absurdity of a negative real rate of return. As China continues to harden its stance on territorial disputes, a recent report notes that the People’s Liberation Army Navy (PLAN) has transferred 11 decommissioned warships, including two destroyers, to the country’s maritime surveillance agency. After undergoing renovation, the vessels—which include the two Type 051 (Luda I-class) guided-missile destroyers (DDG) Nanning and Nanjing, as well as surveillance ships, tugs and icebreakers—were transferred to the China Marine Surveillance (CMS) agency to “alleviate the insufficiency of vessels used to protect maritime interests.” The two 3,250-tonne destroyers, which can travel at a maximum speed of 32 knots, are to split their time between the East China Sea, the scene of a mounting dispute with Japan and Taiwan over the Diaoyu/Senkaku islands, and the South China Sea, where China has overlapping territorial claims with a number of countries, including Vietnam and the Philippines. Prior to their decommissioning last year, the two 30-plus-year-old DDGs were armed with 130mm guns with a range of 29km, as well as anti-ship missiles. China’s Ministry of National Defense and the CMS have yet to comment on the transfer. U.S. intelligence, alarmed at the emergence of a jihadist sanctuary in northern Mali, is considering providing Algeria, the military heavyweight in North Africa, with a surveillance satellite to monitor al-Qaida operations in the Sahara region. The Algerians, whose forces have been fighting Islamist militants since 1992, are wary of bringing in outside powers like the United States and France, the former colonial power which remains deeply suspect in Algeria. There is now enough video and photo evidence to confirm that the Burmese military has deployed fighter jets and helicopters close to its border with China to use against the Kachin Independence Army (KIA). One video circulating on Facebook, in which you can hear a man speaking Kachin, shows a fighter jet being shot down. Despite this, and various other videos of attack helicopters and planes flying low over KIA positions, the government on Monday denied it was using aerial power. In many respects, 2012 was a year of waiting: waiting for a path forward on the European debt crisis; waiting for the results of a polarizing U.S. election; waiting for the Chinese leadership transition; waiting for a resolution to the U.S. fiscal cliff issues; waiting for the Middle East to find peace; waiting for a clear path to global growth; and therefore, waiting to invest additional assets in the markets (or not, as the case may be). In this 2013 Outlook, Michael Cembalest, JPMorgan Asset Management's Chairman of Market and Investment Strategy, provides a comprehensive summary of the global factors at play, with a tone of optimism grounded in realism. Perhaps just what we need after the surreality of the last two days. ...with better news in the US and China than in Europe, and with leading indicators pointing to more activity in services than in manufacturing. Looking ahead to the spring, debt ceiling and continuing budget resolutions may be even more contentious. What will the sticking points be? There’s not much left to fight about on non-defense discretionary spending, scheduled to hit a 50-year low in 2017. As shown below, outlays on things like energy R&D, education, worker retraining and infrastructure are increasingly crowded out by entitlements. The positions are clear: Democrats either simply do not believe that entitlement math is unsustainable, or search in vain for sufficient tax hikes to pay for them; while Republicans search for the political cover to scale back social programs and still get elected. Of all the advice given by the country’s founders, perhaps none is more forgotten than the admonitions in George Washington’s farewell address: to cherish public credit, preserve it by using it as little as possible, and to “not ungenerously throw upon posterity the burden which we ourselves ought to bear". ...a portfolio of risky assets should generate modestly positive returns by the time the year is over. 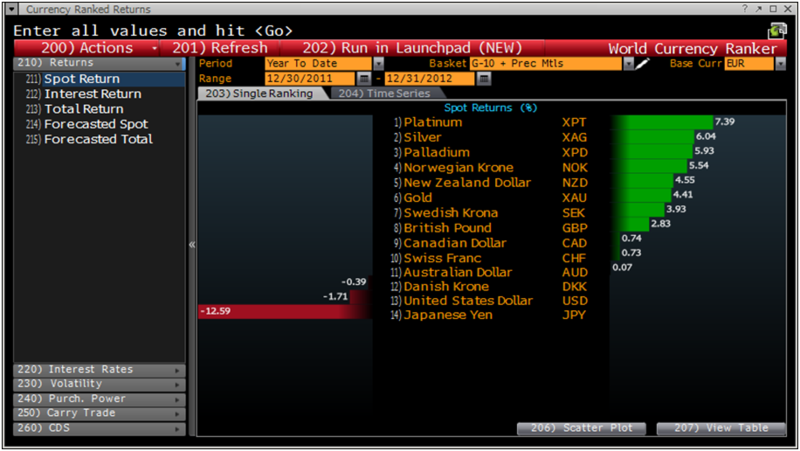 In all, 2013 looks to be another year of markets outperforming what economic growth conditions alone would imply. It’s not an overstatement to say that we are living through the largest policy experiments of the last 300 years. In the US, Europe, Japan and the UK, governments account for 75% of all borrowing that is taking place, and central banks account for 60% of all lending, both multiples higher than anything we have seen (or read about) before. As a sign of the times, monetary policy was the primary issue in the recent election in Japan; voters gave a decisive victory to the party that campaigned on forcing its central bank to provide more of it. Central banks appear determined to reflate financial assets, hoping for whatever spillover they can get to economic growth. On the following pages, Michael walks through a graphical depiction of the issues on the front cover; an economic review of the US, Europe and the emerging economies; and a summary of investment and market views. At the end, a look beyond 2013 at two litmus tests for America: entitlements and energy independence. Note that $1642 was also the 61.8% retracement level as well as the point where waves A and C would have been equal. 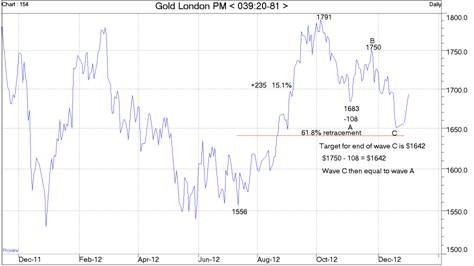 That target of $1642 was not achieved, the lowest PM fix being $1650 on Dec 20, 2012. There was a slightly lower morning fix the next day, but there is enough evidence when combined with the Comex gold chart to conclude that the correction from $1797 has been completed. 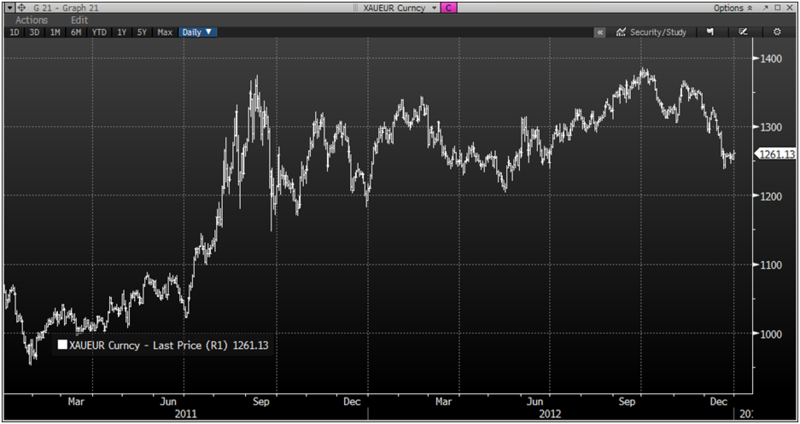 Once $1800 is taken out on the upside, the gold chart will look tremendous. 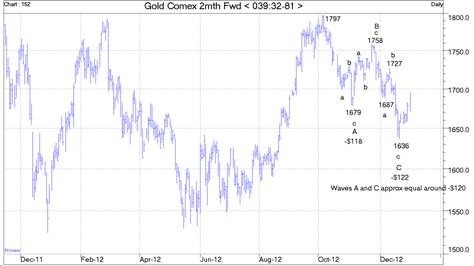 A beautiful “cup and handle” base would then provide strong support for a vigorous upward climb in the precious metal. At this stage there is no reason to abandon the rough target of $4500 for this coming upward wave. Once we have the next upleg above $1800 in place, it will be possible to start refining this target. JERUSALEM (Reuters) - Israel completed the main segment of a razor-wire fence along its border with Egypt on Wednesday, a barrier against illegal migrants and Islamist militants hiding out in the lawless Sinai region. The five-meter high fence, bolstered by military surveillance equipment, is touted by Prime Minister Benjamin Netanyahu as proof of his commitment to the Jewish state's security as he campaigns for a national election on January 22. Once the final 14 kilometer (8.5 mile) section is completed within three months, the fence will stretch from Israel's Red Sea port of Eilat to the Gaza Strip on the Mediterranean. In the desert beyond, hardline Islamist groups have expanded in a security vacuum caused by the overthrow of Egyptian President Hosni Mubarak in 2011 and efforts to re-impose central authority have been slow. Islamist gunmen killed at least 16 Egyptian border guards in Sinai last August and hijacked an armored vehicle which they smashed across the frontier before they were killed by Israeli forces. With security and illegal immigration a target of his campaign, Netanyahu travelled by military helicopter to the southern frontier for a ceremony marking the completion of the 230 km (143 miles) section of fence. His government has accelerated its construction, deported some migrants and imposed legal penalties on Israelis who hire them without work permits. Thirty-six migrants crossed illegally into Israel last month and were arrested, compared with 2,153 who entered a year ago, Netanyahu's office said in a statement. "Just as we stopped completely the infiltration into Israeli cities, we will succeed in the next mission - the repatriation of tens of thousands of infiltrators already in Israel to their home countries," it cited Netanyahu as saying at the ceremony. More than 60,000 Africans have entered Israel on foot in recent years seeking work or refuge. They have stirred fears for public order and some have come under racially-motivated attack. The bulk are from Sudan or Eritrea and Israel's ability to repatriate them is limited. Sudan's government is hostile to Israel and Somalia is deemed a ravaged danger zone by refugee advocates. Israel portrays the vast majority of the migrants as illegal job-seekers. Humanitarian agencies say they should be considered for asylum. For nearly a decade, rising investment demand for silver — from coins to futures to exchange-traded funds — has been the primary driver behind a bull run that has taken silver prices from a meager average of $4.85/oz to highs not seen in 30 years. Since the 2008 crash, investors have counted on continued central bank quantitative easing measures to devalue global currencies and push gold5 and silver prices higher. Now, many analysts are once again looking6 to massive liquidity expansion and the resulting currency devaluation to drive safe-haven investment in precious metals. Ongoing economic uncertainty will push big-money investors and financial institutions toward hard assets like precious metals, driving up the cost of gold. In the face of rising gold prices, retail investors will be drawn to silver’s relative affordability. Morgan is confident that silver will hit $50 an ounce in 2013. The silver market’s historical proclivity for wide upswings and even wider downward spirals has earned it the moniker “the Devil’s metal.” At the start of 2012, silver investors were warned9 to expect more of the same. Silver is a much smaller market compared to gold; that and its dual nature as both a precious and industrial metal are responsible for most of the white metal’s volatile and unpredictable price performance. Silver’s stellar performance in the first quarter10 of 2012 gave hope to many a silver bug that the precious metal was on track to reach its record high of $50 an ounce for a second year in a row. But industrial demand fell11 by about 6 percent for the year and the decline took some support out of spot prices. Silver barely broke the $35-an-ounce range during a short seasonal rally in the fall. 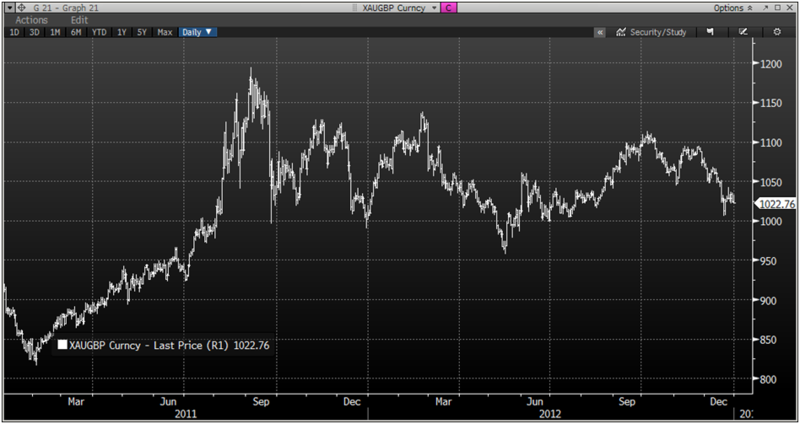 In the last quarter of 2012, silver has lived up to its reputation, with 100-day historical volatility nearly twice as high as that of gold, as Silver Investing News reported12 Friday. That has left silver fighting to stay above $30 an ounce. If the financial crisis in Europe worsens and Washington fails to prevent the US from falling off the proverbial fiscal cliff, economic growth could slow, meaning that industrial demand for silver will suffer. Such a reality could have a far greater impact on spot prices given that the market is already oversupplied. However, analysts are banking on improved economic growth in China and continued strength in emerging economies to support the global economic recovery going forward. Bank of America (NYSE:BAC16) analysts have forecast6 an average of 3.2 percent in global economic growth in 2013. The new year brings the possibility of modest growth in silver industrial demand if the global economic recovery continues. A recent Thomson Reuters GFMS report shows11 that industrial demand for silver will gain 6.7 percent in 2013 and 6 percent in 2014; a much-needed turnaround from last year’s losses and a boon to silver prices if the other side of the coin, investment demand, proves strong in 2013. Analyst outlooks for the average silver price in 2012 — ranging from $30/oz to $52/oz — revealed just how tricky it can be to predict the metal’s performance, and 2013 is no different. 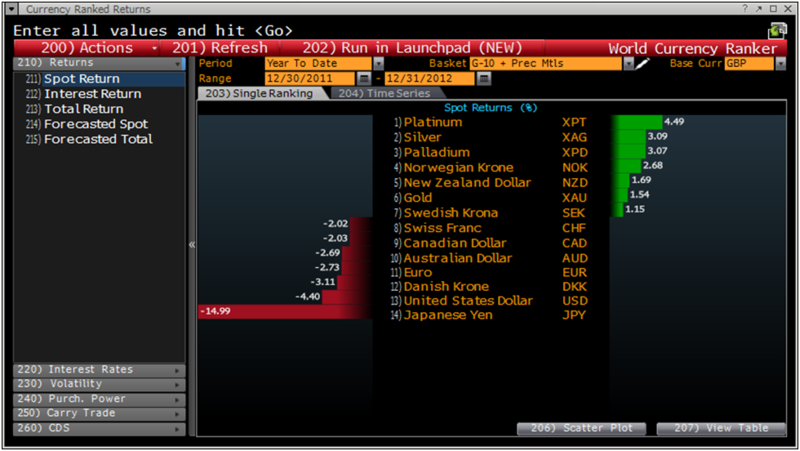 Below are a selection of forecasts for silver’s average price performance in the new year. With all the special-envoy visits to Moscow and accompanying news headlines, a casual observer might easily conclude that Russia holds the key to resolving the Syrian crisis. But as the latest round of failed talks this weekend – this time between Russia’s foreign minister, Sergey V. Lavrov, and Lakhdar Brahimi, the United Nations and Arab League envoy on Syria – conclusively demonstrate, Russia will not be part of the solution on Syria. The worst-case scenario is a world war between the West — NATO, U.S., EU with Japan-Taiwan-South Korea — and the East—the Shanghai Cooperation Organisation (SCO) with Russia, China, Central Asia as members and India, Pakistan, Iran as observers. With four nuclear powers on each side, and West versus Islam as a major issue. In the centre is the explosive mix of a divided territory (Israel-Palestine) and Jerusalem, a capital divided by a wall. The first Basel agreement on global banking regulation, adopted in 1988, was 30 pages long and relied on simple arithmetic. The latest update, known as Basel III, runs to 509 pages and includes 78 calculus equations. The complexity is emblematic of what happened over the past four years as governments that injected $600 billion to rescue failing banks during the worst financial crisis since the Great Depression devised ways to make the global banking system safer. Those efforts have been stymied by conflicting laws, divergent accounting standards and clashing rules adopted by nations to protect their interests, all of which have created new risks. While higher capital requirements, curbs on banks trading with their own money and other rules have reduced risk, they have magnified the complexity of supervision, according to two dozen regulators, bankers and analysts interviewed by Bloomberg News. Even if the new regulations can be enforced, they don’t go far enough to ensure safety, said Robert Jenkins, a member of the Bank of England’s financial policy committee. One reason the trucks have slowed is that the 27 nations represented on the Basel Committee on Banking Supervision agreed in 2010 to require banks to hold more capital, or shareholders’ money, to absorb losses. Dozens of countries including the U.S. have issued other regulations or passed laws to curtail risk, and lenders on both continents have boosted capital and improved its quality since the crisis. Current TV, the network co-founded by former U.S. Vice President Al Gore, was sold for about $500 million to Al Jazeera, the Qatar-based cable-news channel, according to two people with knowledge of the deal. The proceeds represent an eightfold increase from the $60 million Gore and his partners paid for its predecessor in 2004, said one of the people, who asked not to be named because the terms are private. Gore, chairman, and Joel Hyatt, a co-founder and chief executive officer, announced the sale yesterday in a statement, without providing financial terms. “We are proud and pleased that Al Jazeera, the award- winning international news organization, has bought Current TV,” they said in the statement. Al Jazeera will replace existing shows with its own this year, according to a statement from the buyer. The move expands its U.S. footprint beyond the pay-TV providers that carry the programming. Current TV, a news and opinion channel, reaches almost 60 million U.S. homes. Al Jazeera’s English network was started in 2006 and reached 250 million households in 130 countries, according to its website. Stan Collender, a spokesman for Al Jazeera with Qorvis Communications LLC, said the company declined to comment on the price. He said Al Jazeera in the U.S. is carried by seven companies and reaches 4.7 million households. Venezuela’s opposition said cancer-stricken President Hugo Chavez is unable to fulfill his duties and that the government should temporarily hand his full powers over to Vice President Nicolas Maduro. Ramon Guillermo Aveledo, executive secretary of the opposition alliance known as the Democratic Unity Table, said the government should “tell the truth” about Chavez’s state of health. The self-declared socialist, who is supposed to be sworn-in for his next term on Jan. 10, hasn’t been seen in public since alighting from a plane in Havana Dec. 10 to undergo a fourth cancer-related surgery. “To attempt to make people think that the president is currently in control of his functions is an enormous irresponsibility because it’s obvious and evident that he isn’t,” Aveledo said yesterday in comments broadcast on Globovision. Maduro said Jan. 1 he’d return to Caracas after spending time at Chavez’s bedside during a four-day visit to Cuba. He said the 58-year-old suffered renewed complications from a respiratory infection after his latest operation. Aveledo cited an article in Venezuela’s constitution that states that a “temporary absence” should be declared and full presidential powers transferred to the vice president for as much as 90 days if the president is away from the country for more than five days. During frequent absences for treatment in Cuba since June 2011, Chavez has repeatedly declined to hand over power, saying he could govern from the communist island. Under the constitution, if Chavez is unable to start his new term on Jan. 10 and doesn’t step down, the National Assembly president must determine if the absence is temporary or permanent. If his absence is deemed permanent, the assembly president must call for an election within 30 days. Current National Assembly President Diosdado Cabello, a rival of Maduro, faces re-election Jan. 5. In a resolution in the Official Gazette dated Dec. 21, Chavez transferred to Maduro the presidential powers to authorize debt sales, seize assets, approve changes to Venezuela’s annual budget and accept or reject proposals submitted by government ministers. While Maduro was in Cuba, he appointed Electricity Minister Hector Navarro as temporary vice president until Dec. 31. New York Times Op Ed: "Let’s Give Up on the Constitution"
Guest Post: On New York Times Op Ed: "Let’s Give Up on the Constitution"
This New York Times Op Ed by Louis Michael Seidman, a constitutional law professor at Georgetown University, is one of the most absurd and dangerous articles I have read in a very long time. This guy’s incredible conclusion is that it is the Constitution of the United States itself that is causing all that ails the nation at this time. Not once did I read about the Federal Reserve, or the “war on terror,” or the banker bailouts, or the complete destruction of the rule of law in recent years. Nope, none of that. Instead, this scholar’s conclusion is that the founding document, which created the fertile breeding ground for freedom and free markets and led to tens of millions of people to flee to from all corners of the globe, is the problem. 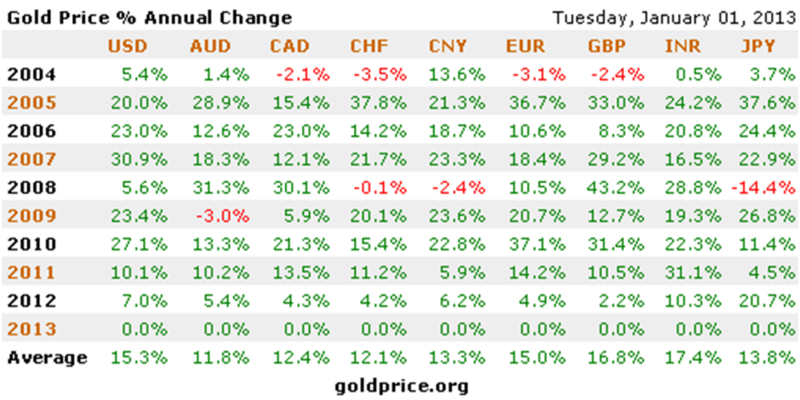 Gold saw gains against all fiat currencies again in 2012 (see charts and tables). Gold rose 7% in US dollars and was 4.9% higher in euro terms and 2.2% higher in sterling terms or to put it more correctly the major fiat currencies fell these amounts in 2012 against immutable gold. The gains were the smallest annual gains since 2008 but built on the steady gains of the last 12 years. 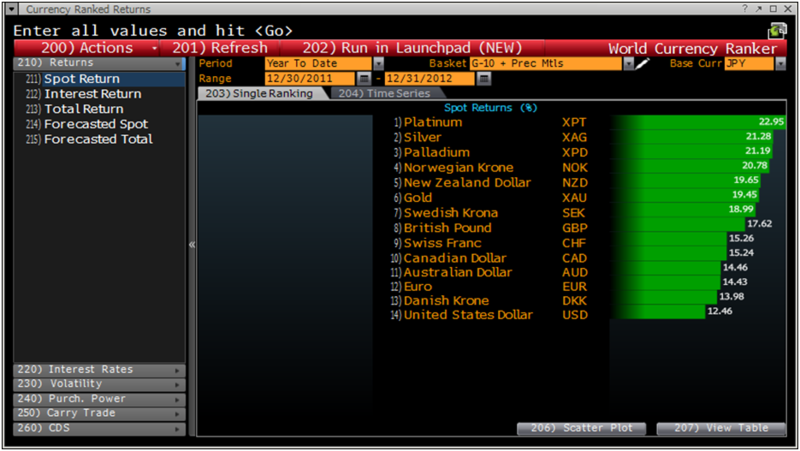 Silver also had a stellar year with all fiat currencies falling against silver in 2012. Silver was 8% higher in US dollar terms and 6.6% in euro terms, 3.9% in sterling pound terms and by 22.6% in Japanese yen terms. 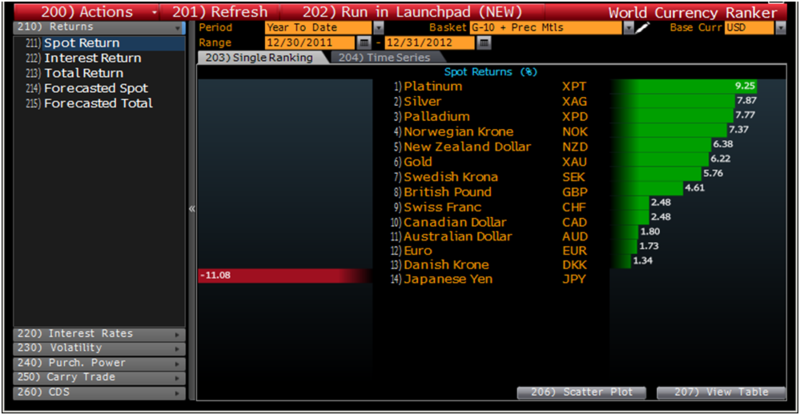 Platinum and palladium also saw gains and returned 9% and 7.5% respectively. Global shares rallied in 2012 with the help of central banks flooding the world with money and a tentative global economic recovery. The MSCI All-Country World Index of equities increased 16.9%. 23 out of 24 benchmark indexes in advanced countries rose, with Greece, Germany and Denmark in the lead. Spain was the loser. The UK's FTSE 100 rose 5.8%; Germany's Dax jumped 29.2%; France's CAC 40 added 15.2%; Italy's FTSE MIB gained 7.8% while Spain's IBEX 35 dipped 4.7%. 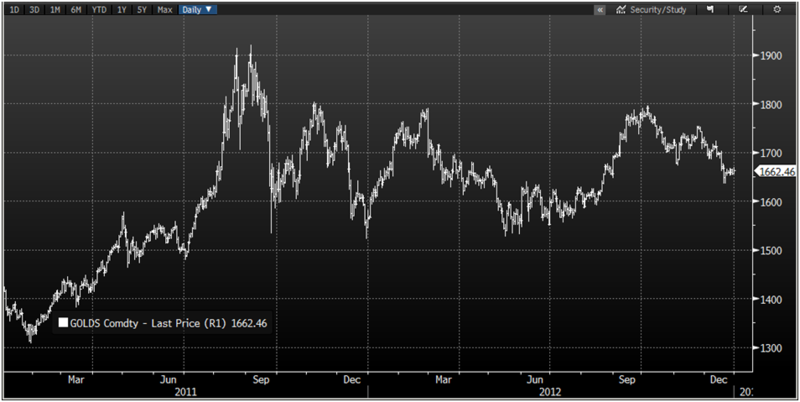 Gold fell in seven months of the year and rose in five (January and June to Sept). Interestingly, gold’s biggest monthly rise was in January when gold returned 11.1%. Thus, speculative buyers not allocated to gold at the start of the year and attempting to time the market may have not enjoyed the gains of 2012. Gold’s importance as a safe haven asset and currency that protects against currency devaluations was again seen – especially in Japan. Japanese investors and savers who owned gold had a return of 20.7% as the Japanese yen fell sharply on international markets. 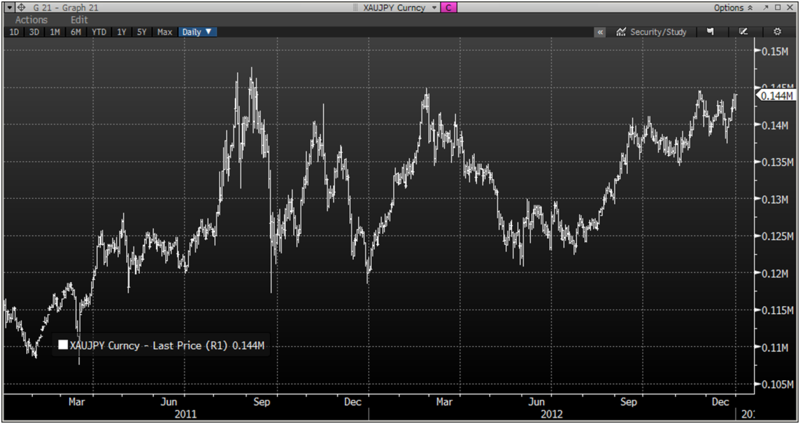 The ‘safe haven’ yen had already fallen 8.8% in 2011. Sterling was one of the strongest fiat currencies in the world in 2012 – along with the Norwegian Krone and New Zealand Dollar – but it too fell against gold. The appalling fiscal situation in the UK means that sterling could in 2013 see falls on a par with that seen in the yen in 2012. The UK is one of the most indebted countries in the industrialised world - the national debt now stands at more than £1.1 trillion pounds (more than $1.7 trillion) and total debt to GDP in the UK remains over 500%. Pro-Taliban Pakistani tribal leader Maulvi Nazir Wazir, also known as Mullah Nazir, speaks during a news conference in Wana, the main town of the South Waziristan region bordering Afghanistan in this April 20, 2007 file photo. A U.S. drone strike killed a Nazir, his deputy and eight others in northwest Pakistan, intelligence sources and tribal leaders said January 3, 2013, deaths that could substantially alter the power balance in the Taliban heartland of Waziristan. WANA, Pakistan (Reuters) - A U.S. drone strike killed a key Taliban commander, his deputy and eight others in northwest Pakistan, intelligence sources and tribal leaders said Thursday, deaths that could substantially alter the power balance in the Taliban heartland of Waziristan. Maulvi Nazir Wazir, also known as Mullah Nazir, was killed on Wednesday night when missiles struck a mud house in South Waziristan, near the Afghan border, intelligence sources and residents said. He had survived at least one previous drone attack and was wounded weeks earlier in a bomb attack believed to have been launched by Taliban rivals. His key commanders and his deputy, Ratta Khan, were also killed in the attack at Angoor Adda, near the provincial capital of Wana, sources said. Nazir had expelled foreign militants from his area, favored attacking American forces in Afghanistan and had signed non-aggression pacts with the Pakistani military in 2007 in 2009. That put him at odds with some other Pakistan Taliban commanders, but earned him a reputation as a "good" Taliban among some in the Pakistan military. Nazir's successor was announced in front of a crowd of thousands at his funeral, a witness said. People will be watching closely to see if fellow Wazir tribesman Salahud Din Ayubi continues with Nazir's policies. The military has a large base in Wana, where Nazir and his men were based. Nazir presided over an uneasy peace between the militants and the army there, but the truce was endangered by the military's alliance with the United States and drone strikes, a military officer said recently. "The (drone) program is making things very difficult for us. Nazir is the sole remaining major militant leader willing to be an ally," he said. "If he decides to side with (Pakistan Taliban leader) Hakimullah, thousands of fighters will come to the frontlines against the Pakistani military. It is in our interest to keep him neutral, if not on our side, because then we can direct our resources against anti-state militants with much greater efficiency." Militants have launched a string of attacks in Pakistan in recent months, including shooting dead 16 aid workers and an attack by multiple suicide bombers on the airport in the northern city of Peshawar. Residents said the main market in Wana shut down on Thursday to mark Nazir's death. The were calls over loudspeakers for prayers for his soul. "The tribesmen are very grieved at his death as he was our hero. He had expelled all the foreign militants from our villages and towns and given real freedom to our people," a local shopkeeper in Wana bazaar, Siraj Noor Wazir, said.